Pharmaceutical Chemistry Division, Faculty of Pharmacy, Asia Metropolitan University, G-8 Jalan Kemacahaya 11, Taman Kemacahaya, 43200 Cheras, Selangor, MALAYSIA. Pharmaceutical Chemistry Division, School of Pharmacy, International Medical University, 126, Jln Jalil Perkasa 19, Bukit Jalil, 57000 Bukit Jalil, Wilayah Persekutuan, Kuala Lumpur, MALAYSIA. We aimed to develop and validate a simple UV-spectrophotometric method relates to the estimation of curcumin in standardised polyherbal formulations. Pure curcumin was received as generous gift sample from Andhra University, India, all solvents and reagents of analytical reagent (AR) grade were procured from local suppliers and readily used for the method development. The method validation parameters were evaluated as per International Conference on Harmonization (ICH) guidelines. Further, this method was applied for the assay of curcumin in marketed product Live-well™, CUMIN (standardised turmeric extract (STE) fortified with standardised black pepper (SBE) extract) capsules using UV-spectrophotometric method. It was confirmed from the results of method validation characteristics such as specificity, linearity, range, precision, accuracy, and robustness were keeping within the limits of acceptance criteria defined under ICH guidelines, 76.0560% of curcumin was estimated to be present in each Live-well™, CUMIN capsule containing a minimum 95% of the total curcuminoids (label claimed). In summary, our method was found to be reliable in detecting the unknown percentage of curcumin in Live-well™, CUMIN capsule formulation. Also, the method was proved to be specific, linear, precise, accurate and robust to use for routine analysis of polyherbal formulations containing curcumin as their principal component in the extracts. In the post genomic era, World Health Organization (WHO) estimated about 80% of the world population uses herbs and other traditional medicines for their primary health care needs.1 Tremendous raise in the use of herbal medicine is leading to a fast-growing market of polyherbal formulations worldwide.2 Whereas, according to WHO guidelines, standardization of herbal products is essential in order to assess the quality, clinical safety and efficacy before releasing into the market.3 Turmeric (Curcuma longa Linn.) is a perennial herb belonging to the family Zingiberaceae also called curcumin.4 The yellow color of turmeric is mainly due to the presence of polyphenolic curcuminoids.5 In commercially marketed curcumin (turmeric extracts), curcumin, available in a mixture of three curcuminoids, usually contains 77% pure curcumin, 17% demethoxycurcumin and 3% bisdemethoxycurcumin.6 It has been reported that different species of Curcuma have different percentages of these individual curcuminoids.7 Among the curcuminoids, curcumin has been attained significant attention due to its bioactive potential.8 Numerous clinical trials over the past two decades have addressed the safety, and efficacy of this nutraceutical against multiple diseases including cancer, diabetes, acquired immunodeficiency syndrome (AIDS) etc.9 Acute toxicity studies have indicated the safety of curcumin at doses as high as 12 g/day over 3 months.10 In complementary and alternative medicine therapies, curcumin has significant role either alone or in combination with other herbs.11 A variety of polyherbal formulations of turmeric extracts have been marketed commercially in which the percentage of curcumin is vital to ensure physiological benefits. Conversely, several marketed polyherbal formulations are available without labeled claim on relative percentage composition of individual curcuminoids.12 Several methods were reported for the estimation of curcumin in different pharmaceutical and herbal formulations by using UV,13 HPLC,14 UPLC,15 HPTLC,16 FT-IR17 and others hyphenated methods.18,19 However, these techniques are not suitable for analyzing compounds in combinations of polyherbal formulations like Ayurvedic or Chinese medicinal products, since they contain more than one herb. While UV-spectrophotometric methods are more suitable for this objective, studies on dedicated UV-spectrophotometric methods to quantify the curcumin in polyherbal formulations are very limited.20 Therefore, in the present study, a simple UV method was developed and validated according to international conference harmonization (ICH) guidelines for the quantitative estimation of curcumin in polyherbal formulations.21 The method has also been tested by using market available Live-well™, CUMIN capsules. Literature survey also revealed that, to date, no UV method has been proposed using ethyl acetate as solvent for the assay of curcumin in polyherbal formulations. Jasco double beam UV-Vis spectrophotometer (Model V-630) with 1.5 nm spectral bandwidth using 10 mm matched quartz cuvettes. Data acquisition was performed by using spectra manager software version 2.0. Secom am single beam UV-Vis spectrophotometer (Model: XTD 6) with 2 nm spectral band width using 10 mm matched quartz cuvettes. All weights were taken on electronic analytical balance (Mettler Toledo™, USA). Pure curcumin was obtained as generous gift sample from Pharmaceutical Chemistry Research Laboratories, AU College of Pharmaceutical Sciences, Andhra University, Visakhapatnam, India. The capsule polyherbal formulation (Live-well™, CUMIN, PC: QG86, Batch No. 15N16, Mfg. Date. 05/15, Exp. Date 04/18) containing 400 mg of Turmeric Standardised Extract (TSE) fortified with 2.5 mg of Black pepper standardised extract (BSE) was procured from local retail pharmacy, Caring Pharmacy Sdn Bhd (CST) (296901-H), Jalan Cheras, Kuala Lumpur, Malaysia. Analytical grade ethyl acetate and all other chemicals were purchased from NEXBIO Sdn Bhd (1059366-H), Petaling Jaya, Selangor, Malaysia. Standard stock solution contain 100 μg/mL was prepared, 10 mg of curcumin was accurately weighed and transferred into 100 mL volumetric flask and made up to the mark with ethyl acetate, standard solutions were prepared in the concentration range of 1-5 μg/mL by further dilution with ethyl acetate. 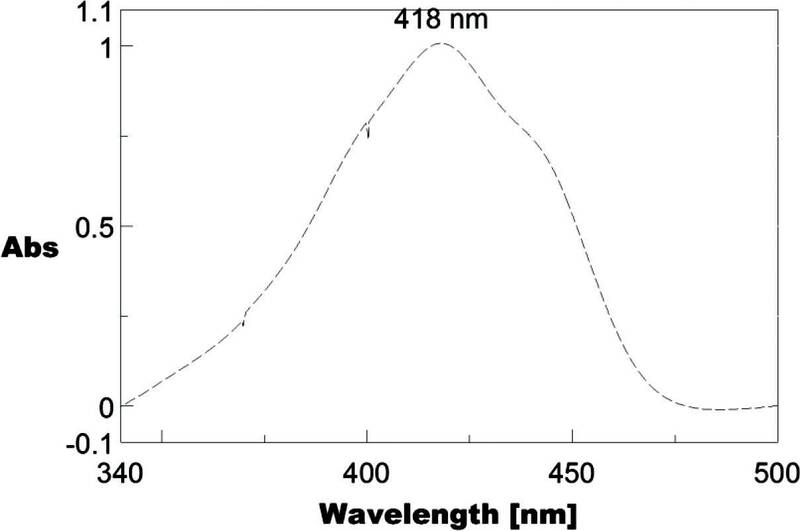 Wavelength of maximum absorption (λmax) was determined by scanning 10 μg/mL solution of curcumin using UV-visible double bean spectrophotometer from 400-600 nm using ethyl acetate as blank. The absorbances of the standard solutions in ethyl acetate at 1-5 μg/mL range was measured at 418 nm. Standard calibration curve was prepared by plotting average (n=3) maximum absorbance (λmax) versus concentration. Linearity was studied using a regression equation. The method was validated according to ICH Q2(R1) guidelines for validation of analytical procedures. Typical validation characteristics such as specificity, linearity, range, precision, accuracy and robustness were considered for evaluation. These measurements regarded as the most important for the validation of assay type analytical procedure. Specificity was confirmed by UV-spectrophotometric scanning of each curcumin standard solution (1-5 μg/mL) in the range of 400-600 nm against ethyl acetate as blank. 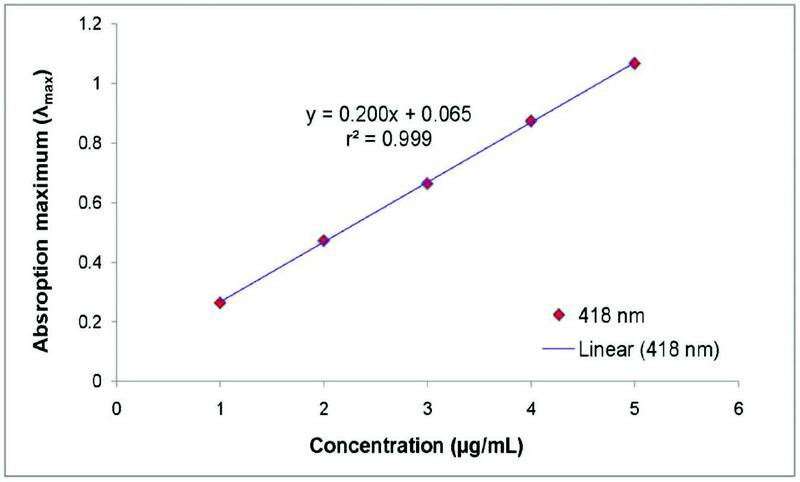 The linearity was determined by analyzing absorbance of the curcumin standard concentrations (1-5 μg/mL) at 418 nm against ethyl acetate as blank. The calibration curve was plotted using concentration against absorbance. A regression equation and correlation coefficient were determined for curcumin standard concentrations (1-5 μg/mL). The data obtained from the linearity and accuracy studies was used to assess the range of the method. Precision was evaluated by using repeatability and intermediate precision. Repeatability was analyzed using curcumin (1 μg/mL) for six times in the same day (intra-day). The intermediate precision was analyzed using three curcumin concentrations (1, 3 and 5 μg/mL) for three times on three consecutive days (inter-day). Accuracy was established by percentage recovery of known added concentrations of curcumin standard (1, 2 and 3 μg/mL) to the pre-analyzed sample solutions (2 μg/mL). The method was repeated for three times for each concentration. Robustness was measured for curcumin standard solution (5 μg/mL) by different analysts and different instruments. The percentage relative standard deviation (%RSD) values for different analysts (analyst 1 and 2) and different instruments (UV-Jasco V-630 and Secom am XTD6) were calculated. A stock solution (100 μg/mL) was prepared by dissolving 10 mg of capsule powder of Live-well™, CUMIN in a 100 mL volumetric flask using ethyl acetate. The solution sonicated for 15 min and filtered through Whatman filter paper No. 41. From the clear stock solution, test solution was prepared at concentration 5 μg/mL by further dilution with ethyl acetate. The percentage of curcumin present in the test solution (5 μg/mL) of marketed product Live-well™ CUMIN capsule was estimated by using absorbance ratio method. Maximum absorbance was measured at 418 nm against ethyl acetate as blank. Analytical method was developed and validated according to ICH Q2 (R1) guidelines Table 1. According to ICH Q2 (R1) guidelines, specificity is the ability to assess unequivocally the analyte in the presence of components which may be expected to be present. Results of specificity are shown in Figure 1. As per ICH Q2 (R1) guidelines, linearity of an analytical procedure is its ability (within a given range) to obtain test results which are directly proportional to the concentration (amount) of analyte in the sample. Results of linearity are shown in Table 2 and Figure 2. UV spectrum of curcumin in Ethylacetate. In accordance with ICH Q2 (R1) guidelines, range of an analytical procedure is the interval between the upper and lower concentration (amounts) of analyte in the sample (including these concentrations) for which it has been demonstrated that the analytical procedure has a suitable level of precision, accuracy and linearity. Results of range are shown in Table 2 and Figure 2. Based on the ICH Q2 (R1) guidelines, precision of an analytical procedure expresses the closeness of agreement (degree of scatter) between a series of measurements obtained from multiple sampling of the same homogeneous sample under the prescribed conditions. Precision may be considered at three levels: repeatability, intermediate precision and reproducibility. Results of precision (repeatability and intermediate precision) are shown in Tables 3 and 4. Established ICH Q2 (R1) guidelines specified that the accuracy of an analytical procedure expresses the closeness of agreement between the value which is accepted either as a conventional true value or an accepted reference value and the value found. Results of accuracy are shown in Table 5. In agreement with ICH Q2 (R1) guidelines, the robustness of an analytical procedure is a measure of its capacity to remain unaffected by small, but deliberate variations in method parameters and provides an indication of its reliability during normal usage. Results of robustness are shown in Table 6. Linearity and range of the proposed UV method. Results of assay of curcumin in polyherbal formulation (Live-well™, CUMIN) capsule formulation is shown in Table 7. During method development phase, the use of a few milliliters of ethyl acetate as solvent resulted in considerable outcome in UV analysis. Hence, the solvent was optimized to ethyl acetate. The main reason for the selection of ethyl acetate as solvent for developing UV method was based on its biodegradable and ecofriendly (not dangerous for the environment) properties. It is one of the most commonly used solvent in chromatographic separation of curcuminoids. Furthermore, ethyl acetate absorbs in the wavelength range of 200 to 235 nm that does not interfere with the absorption range of curcuminoids at 400-600 nm. The proposed UV-spectrophotometric method was found to be specific and selective for assay of curcumin in polyherbal formulations, the optimized solvent was ethyl acetate and wavelength of maximum absorption (λmax) of curcumin was appeared at 418 nm Figure 1. Repeatability (Intra-day precision) of the proposed UV method. In conclusion, we have developed and validated a method that was found to be eco-friendly, simple, cost-effective and was successfully applied for the estimation of curcumin in Live-well™, CUMIN capsules without involvement of any interference from other phytochemicals forming part of the formulation ingredients. Based on the results and statistical parameters demonstrate that this method could be the specific and remarkable for the analysis of curcumin in polyherbal formulations or turmeric extracts. One of the authors (Ashwinder Singh A/L Guru dev Singh) is thankful to the Dean, Faculty of Pharmacy and to the Vice-chancellor, Asia Metropolitan University, Malaysia for providing Bachelor of Pharmacy (Hons) Graduate Research Grant, instrumentation facilities to carry out the research work.